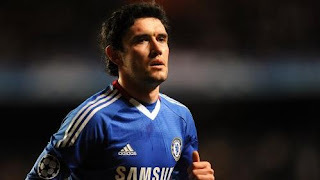 Russian Premier League side Anzhi Makhachkala have completed the signing of Yuri Zhirkov from Chelsea on a four-year deal, according to reports. Anzhi are so far refusing to comment, but Russian media reports claim Chelsea will receive £13.2m (€15.2m) for the 27-year-old international. Sports daily Sovietsky Sport suggests Zhirkov has already signed a contract, and that his wife, Yulia, is viewing apartments in Moscow. Zhirkov will reportedly receive a €5.5m annual salary in Makhachkala, becoming the Russian league's top earner. Two years ago, Chelsea payed £18m to sign Zhirkov from CSKA Moscow. However, he failed to settle and in the last two years played just 49 matches, scoring only one goal. Anzhi are based in Makhachkala - capital of the Caucasus republic of Dagestan, which is one of Russia's most dangerous and unstable regions.